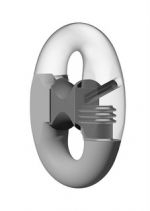 The Feubo Trident Thin Kenter Joining Shackle is designed for Mooring Systems. It is a Joining Shackle used on Offshore Chain. The Trident Thin Kenter comes with our 3 tooth locking mechinism superior to the single tooth Kenter offering greater fatuge life.